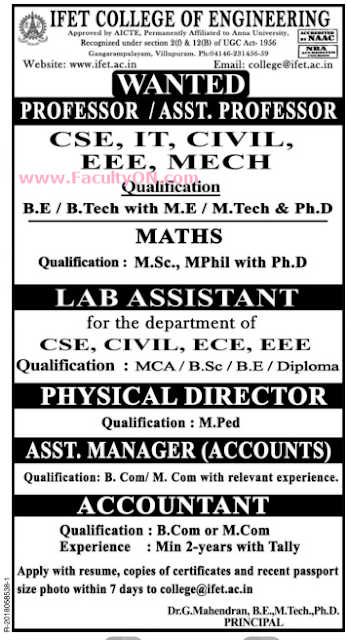 IFET College of Engineering, Villupuram has advertised in the DINAMALAR newspaper for recruitment of Professor / Assistant Professor / Lab Assistant / Physical Director / Assistant Manager (Accounts) / Accountant jobs vacancies. Interested and eligible job aspirants are requested to apply within 07 days from 24th July 2018. Check out further more details below. About College: Founded in 1998 by eminent Industrialists and some benign NRIs, Indo French Educational Trust (IFET) is committed to promote education and research in the field of Engineering and Technology and to collate and disseminate in such fields with effective ideas, methods and techniques.